The premise is familiar now. Send a modern family into the past and make them live with only the tools and resources available centuries ago. In this case, the modern Americans are sent to live in the summer of 1628, on a forested island off of Maine. 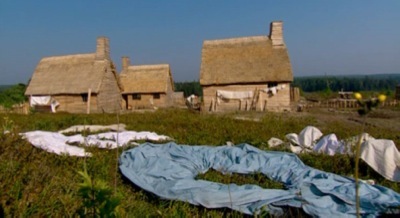 Their task: build a new world colony (20 people strong) that can both survive and pay back its investors in England. Life is pretty grungy. Two families to a room; no outhouses. This is the third in a series of living history documentaries (see 1900 House and Frontier House) – only now they have fewer tools. Of the three programs this is the best, in part because of the reality show-like drama and bickering between the colonists. Cameras record every detail as the pudgy newcomers scrounge for food, learn how to farm Indian corn, all the while slowly starving, and assuming appropriate roles such as indentured servants with astounding ease. Who knew how easy devolution was? Like the hit TV series Survivor, it’s about how primeval people get when survival is at stake. But unlike Survivor, there’s historical logic, authentic rituals, and significant meaning in their test. My kids, both young and teenage, are addicted to these series. 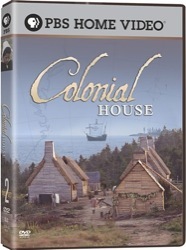 If I had to choose one, I’d start with this one, the 8-hour Colonial House.